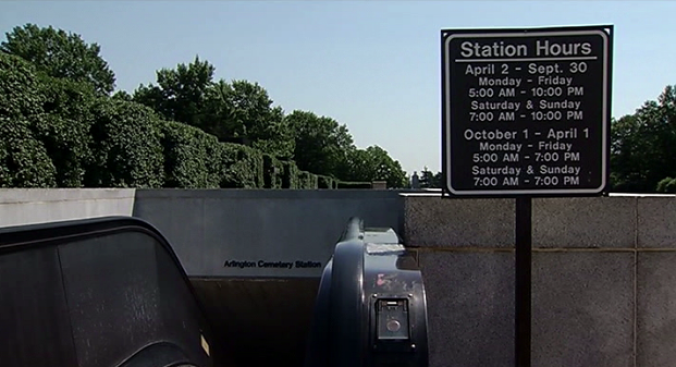 A police officer pepper sprayed a disorderly Metro customer after it looked like he was going to run onto the tracks at the Arlington Cemetery Metro Station. Police were called to the station after the man was seen urinating inside one of the rail cars. The officer cleared the car of passengers and tried to get the man to come out of the car. He refused and then ran out onto the platform. When it looked like he was going to run onto the tracks, the officer pepper sprayed him. Some of the pepper spray got on the officer, and she was taken to the hospital for a checkup. No passengers were harmed during the incident. An increased police presence is expected at some area Metro stations Friday as a part of an anti-terrorism initiative called "Blue Tide." Blue TIDE, which stands for terrorism identification and deterrence effort, is expected to provide a noticeable presence during the evening rush hour. WMATA said at least 50 officers from different jurisdictions will participate. They add the initiative is not in response to any sort of threat to the system.